Munchkin, Zombie Dice, and Ogre (Kickstarter Edition) top sales in 2013 for Steve Jackson Games. Steve Jackson, founder of Steve Jackson Games, doesn't have shareholders to report to, but that doesn't stop him from issuing a yearly "Report to the Stakeholders". The 2013 report lays out the successes and top sellers from last year, challenges and failures at the company, and the priorities for 2014. The tabletop games publisher reports a gross income of over $8.8 million, including almost a million raised by the Ogre Kickstarter. The Munchkin line accounted for over 75% of sales. Dice games, like the popular Zombie Dice, made up 7.6% of total sales. Smaller games like Castellan, Illuminati, and the GURPS roleplaying system rounded out the list. The top priority for 2014 is keeping Munchkin products in print. "Because Munchkin sales keep getting stronger, keeping things in print has taken a lot of work," writes Jackson, commenting on the state of business as of August. "We just reprinted Munchkin Fu, Munchkin Impossible, and Munchkin Quest, each of which had been out of print for some months." 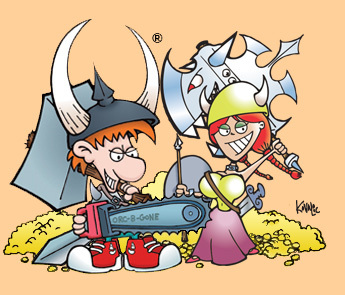 In 2014, Steve Jackson Games has already announced new Munchkin sets, including Munchkin Steampunk, and several licensing deals, like new Munchkin comics from BOOM! Studios. Steve Jackson Games also announed a new game, Munchkin Panic, based on Fireside Games' Castle Panic. Jackson reports that the company is still planning to crowdfund a new edition of Car Wars. The company's first Kickstarter campaign, for the classic tank warfare game Ogre, launched in 2012 and shipped (after some delays) in 2013. Completing all outstanding commitments from the Ogre campaign, including work on a Car Wars relaunch, is listed as a priority for 2014. In less games-focused news, Steve Jackson Games launched the Warehouse 23 shopping cart in early 2014, allowing customers to purchase both digital and physical products in the same order. The web store improvements launched a year later than planned, having been a priority in the 2012 Stakeholder Report. The store remains buggy, and debugging work on the store made the priority list for 2014. Have you picked up any games by Steve Jackson Games this year? After spending a while playing Munchkin Cthulhu, I've been drawn back to the original set. Perhaps it was the Kneepads of Allure?